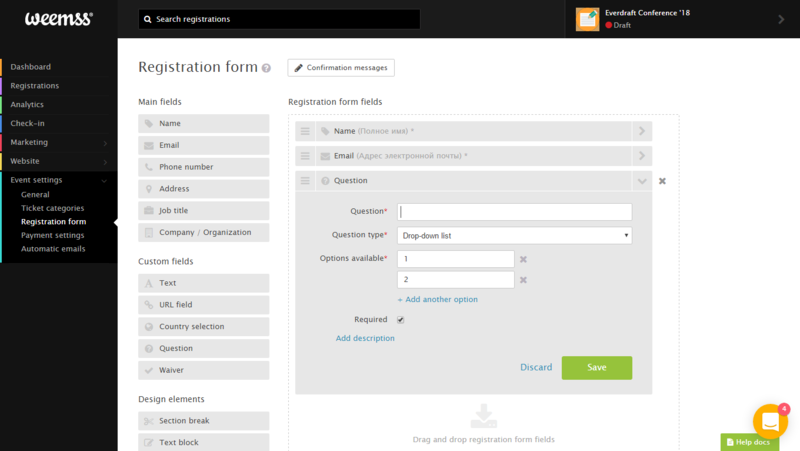 With the easy Weemss drag and drop builder you tailor the registration form for your event exactly the way you want it. You can pick any of the fields and place them on the designated areas. This is done from Event settings > Registration form. Ticket buyer fields: one person can purchase tickets for a whole group of people. The system will send all event related communication to that person’s email address, so the Name and Email fields are added by default. Individual ticket fields: fields you add here will have to be filled in separately for each of the purchased tickets. It is a good idea to collect the information you’re going to need for the individual ticket holders. Additional fields: this section is useful for adding additional elements to your registration form. You can put a question field asking ‘How did you find out about this event?’, add a ‘Terms and conditions’ waiver, or provide any additional information regarding the event. Registration form fields: the fields you add here will be filled-in by the individual that’s buying a ticket or registering for your event. Every field you add to your registration form has the option to be marked as a Required field. This means the person making the registration has to fill in the requested piece of information, or they can’t proceed with the registration process. Additionally you can customize the messages your customers are going to see upon registering. Access your confirmation messages by clicking the (Confirmation messages) button.